One of my favorite April Fool's Day jokes from Worn & Wound, The Trump watch by Trump. There is a chance that Mr. Donald Trump could be the next President of the United States. So how would his watch collection fair against other Commander-in-Chiefs' ? Frankly Mr. Trump's watch collection pales in comparison to past Presidents, especially against Harry S. Truman and Lyndon Baines Johnson. Truman was personally involved with the Gallet Flight Officer being supplied to members of the USAAF and wore one frequently, was the first President to receive a Vulcain Cricket, wore a beautiful Universal Geneve Tri-Compax Ref. 12551 whilst signing the Potsdam Treaty and had many timepieces gifted to him throughout his Presidency. Lyndon B. Johnson was the first President we know that definitely wore a Patek Philippe (Ref. 2526) and the first President to truly love his Vulcain Cricket, even going so far to purchase two hundred in bulk to give away as gifts. He received a unique Jaeger-LeCoultre World Timer and of course his famous Rolex Day-Date "President". Most modern Presidents and candidates are at a disadvantage if they want to wear expensive watches as it is seen as unwise for politicians to flaunt any wealth whilst in office. The last President to wear a luxury watch in office was President Reagan with his Rolex Datejust. You would think that someone who owns a private jet, who formerly owned the Empire State Building and who openly speaks about their apparent yugely successful business would have at least one or two watches on their wrist, if not for a passion for horology but as a status symbol. Not Donald Trump though. 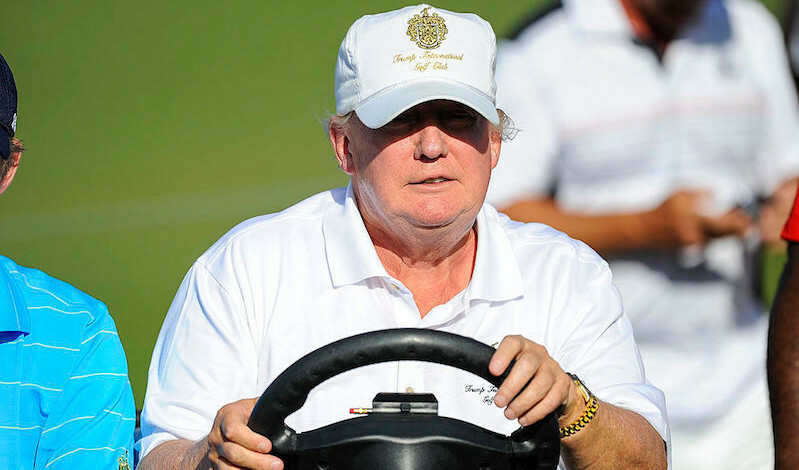 From what I've found, there appears to be five wristwatches associated with Mr. Trump: a yellow gold ultra-thin watch, a larger gold watch that is potentially a Rolex, a Senna chronograph by Universal Geneve, an Azad Power Tourbillon and the Trump Signature Collection that was briefly sold at Macy's. Out of all the photos I've seen, both recent and from years past, Mr. Trump doesn't make it easy to identify what watch he wears as he favors an extra long shirt cuff that blocks the wrist. The few times he's seen wearing a short sleeved shirt there appears to be a thin gold watch with a blue dial. It's possible that this is a Patek Philippe Ellipse but there isn't any way to be certain however the small size and thin profile would match the watch (It could well just as be an ultra thin Timex for all I know). A photo of Mr. Trump and his then-girlfriend-now-wife Melania Knauss from 1999 show a watch peeking under his cuff. Could this be the same watch as in other photographs? This one photo I found from 2014 shows Mr. Trump wearing what appears to be a yellow gold watch on a presidential style bracelet and you can just about make out the raised glass of a cyclops which could mean that it's a Rolex Datejust or Day Date. In 1999, Antiquorum ran the Famous Faces, Watch Auction for Charity with Mr. Trump donating his Senna by Universal Geneve chronograph. The Senna line launched in 1998 by Universal Geneve in collaboration with the Formula 1 driver's family to celebrate his legacy with part of the sales going towards the Ayrton Senna Foundation for Underprivileged children. Mr Trump's piece, Ref. 198.310, was an 18kt yellow chronograph with day date complication with a COSC rated movement. Whilst I love Universal Geneve, it is fair to say that in the 1990's they were well removed from their glory days of the 1940's, 50's and 60's. Universal Geneve were bought by Stelux, a Hong Kong based investment group, in 1986 and their pieces gradually declined in quality until production ceased in the mid 2000's. I think the Senna watch is absolutely hideous. The Senna logo seems completely out of place and the 'by Universal Geneve' underneath the day/date windows makes the dial look incredibly cramped. The articulated hooded lugs are very similar in style to Senna's personal TAG Heuer S/el analogue/digital, a watch that I have equal distaste for. Mr. Trump's watch piece ended up selling with buyer's premium for $6000. Actor Jon Voight and comedian Joan Rivers also donated their Universal Geneve's with Voight's Compax selling for $2,700 and Rivers' Golden Shadow for $6,000. 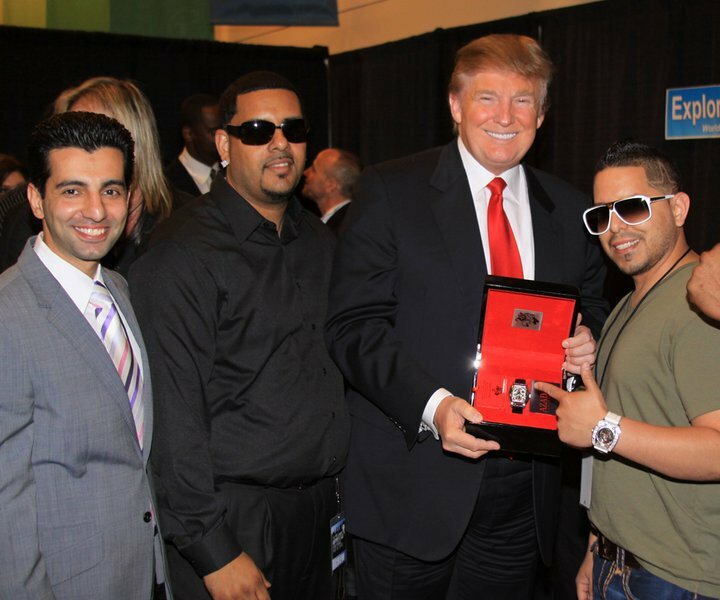 In 2009, New York based faux-luxury brand Azad watches sponsored the Celebrity Apprentice Season Finale party and got Mr. Trump to pose for a few photographs with their Power Tourbillon. I don't think he ever owned or wore the watch as photos of the event show nearly everyone in attendance, including Mr. Trump's wife Melania, being forced to awkwardly hold the box for a photograph. The Power Tourbillon is 39.5mm by 37.mm and the stainless steel skeleton is available at the bargain price of $9,950! Their website doesn't say where the movements are sourced from but at that price I can only assume they are Chinese. If Mr. Trump were to be elected, (Editors Note Nov. 2016: Spoiler Alert, He was) he would become the first President (and potentially world leader) that has ever created/licensed a watch brand under his own name. Released in 2005/6 at Macy's, the Trump Signature brand was a mixture of garish original designs and ones cribbed from more popular watches. Aside from these instances, I haven't seen any proof that Mr. Trump is a watch fan. It is not unusual for Presidents to be unconcerned with wristwatches as a hobby with Presidents Carter, H.W Bush and W. Bush all wearing inexpensive watches whilst in and out of office. President Clinton wore a Timex Ironman during his time in the White House however his tastes became more expensive after leaving office. It is possible that he's been told to stop wearing any luxury watches whilst campaigning as not to appear overly wealthy but even as I type this sentence I realise how ridiculous that idea is. A man who eats KFC with a knife and fork on his own private jet, who has his name plastered on buildings like an American Del-Boy (The initials to Trump Independent Traders in fifty foot high neon letters sounds appropriate) doesn't care that people know he's wealthy.